You are now entering the world of Claudette, Gaston, and Marie (and Rafael and Jorge)! « GIANTS BEWARE! DRAGONS BEWARE! Home » GIANTS BEWARE » You are now entering the world of Claudette, Gaston, and Marie (and Rafael and Jorge)! You are now entering the world of Claudette, Gaston, and Marie (and Rafael and Jorge)! Hello! — This is the blog for Rafael Rosado and me (Jorge Aguirre). We’re the creators of GIANTS BEWARE! 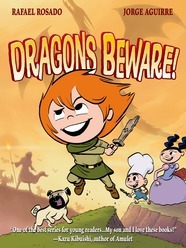 A graphic novel from First Second Books, which will be published on April 10, 2012. Rafael and I are met waaaay back at The Ohio State University. * Rafael is the artist; I’m the writer, and we worked on the story together. Why “CHRONICLES OF CLAUDETTE” ? Well, hopefully GIANTS BEWARE! is the first book in a series, but more on that later. If you want to know something more about us, you can check out About Us. * While, Raf and I will always cheer for our hometown team, the Mighty Ohio State Buckeyes, don’t ask us too much about football or else you’ll quickly discover how little we know about it. (You can, however, ask Jorge about buffalo wings. A central Ohio delicacy of which I am a devotee). By Jorge in GIANTS BEWARE on September 18, 2011 . I can’t wait to enter this world! I already found myself laughing at the sneak peek. And, oh man, that Raf is so talented!